Parrots are highly intelligent and social creatures that require a variety of daily activities to keep them entertained, engaged and challenged. Environmental enrichment is just that - enriching the environment in which our birds live. Picture a parrot in the wild, foraging for food, interacting with flock members, avoiding predators, nesting and exploring new territories. 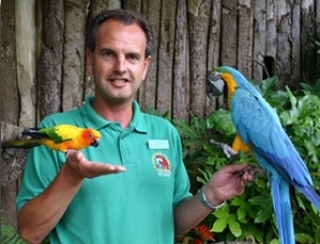 Then consider the parrot in captivity - a very different picture. But it doesn't have to be. David Woolcock joins us in this podcast to help us better understand just what environmental enrichment looks like, and to share some strategies that can - with a little ingenuity, time and a few readily available items - provide your bird with a much more enjoyable world in which to live.